Bowflex Treadclimber TC5 Treadmill has the Newest Design and Lowest Price Ever! Go ahead, put the TC5 anywhere you want! The new, "green," TreadClimber machine is not only the most affordable and space saving model we've ever offered, it's also powered with unique Step 'N Go technology that makes plugs and cords a thing of the past. All you do is WALK, and the TC5's console comes to life! Now any room in your home is the perfect place to get an incredible, calorie-burning workout at our lowest price ever. Minimum Ceiling Height At their highest point, the treadles are 17 inches from the floor (43 cm). *Note: Most of the sites, stores or shopping portals listed above sell Bowflex Treadclimber TC5 with discounts and other exciting offers. 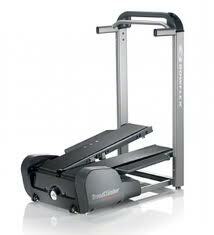 There is a possibility that the some of above websites are not selling Bowflex Treadclimber TC5 now. Toughtrain.com is not liable for such cases or instances. Also we do not recommend any seller for Bowflex Treadclimber TC5 and a buyer should buy from where he/she gets best deal with quality of products, service and on time delivery (shipment).